Tonight, some friends invited us to Papa Haydn’s in NW Portland for an evening of decadent desserts. I ordered the Chocolate Cube, which is dark chocolate mousse, in dark chocolate shell, with vanilla ice cream on top. It was delightful, but so rich that I took half of it home for fear I wouldn’t leave the bathroom for a week. With a giant list of desserts, why did I pick this one, my friends asked. Chocolate mousse is my favorite dessert. 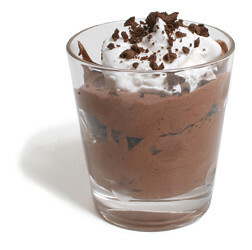 It was my favorite treat when I was a little girl, and one bite instantly takes me back to when my Dad was alive, and we’d be in Monterey or San Francisco for a nice dinner, that always ended with chocolate mousse. I like it enough I learned how to make it. Every year I used to make a batch and deliver it to all of my friends, one layer of dark chocolate mousse, a layer of toffee bits, a layer of white chocolate mousse, and a raspberry or strawberry drizzle. I haven’t made it in eight years; it takes two days to make, at minimum. One of my friends (Mr. Frugal Genius) said that he didn’t get the vanilla creme brulee because he knows how to make it, makes it at home regularly, and won’t spend $7.00 on something he could easily do himself. Should I buy this loaf of bread or bake one? Is the time I’m going to spend on this worth the time away from my family? I still love chocolate mousse as a treat. It’s become much more rare since I don’t make it anymore, but that’s okay. A trip down memory lane doesn’t need to happen every night.